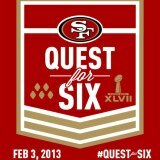 Today the 49ers will play in Super Bowl XLVII in New Orleans against the Baltimore Ravens. Super Bowl excitement is a buzz in my house and Sam's up in Washington. Her hubby is a die hard 49ers fan! 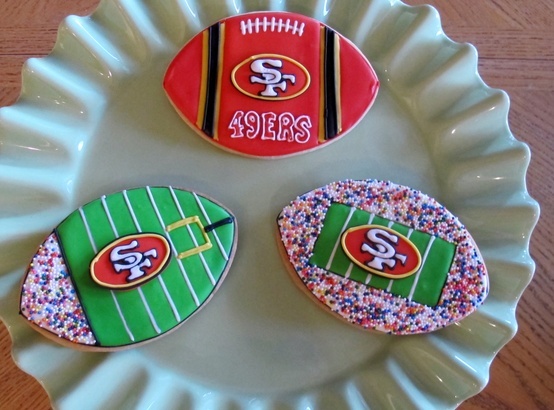 Its awesome to have the 49ers going to the Super Bowl this year, as Nor Cali residents they are our team!! I love that the quaterback is from Turlock, a town in Nor Cali. The coaches of the Baltimore Ravens (John Harbaugh) and the San Francisco 49ers (Jim Harbaugh) are brothers, which marks the first time two brothers who are NFL head coaches have coached against each other in Super Bowl history. Crazy for their parents that will be happy no matter which son wins and then have to comfort the one that loses. But how awesome and a proud moment for the parents of those men! I will be working :( but my husband and son promised to save my some football treats and have fun but not too much fun lol. Lol I didn't know it was referred to shopping day....those cookies are great!